GET THE BOOK HERE: FILIPINO FUSIONS LIMITED EDITION COOKBOOK. Filipino Fusions: A Culinary Critique is now available for purchase nationwide. Inside the Artist’s Kitchen in collaboration with Chicago artist Kiam Marcelo Junio began as a fresh web series and has evolved into a handmade, hardbound, limited edition artists cookbook featuring vegan recipes rooted in Filipino cuisine. The book includes the original recipes from the web series as well as contributions from guest artists, along with poetry, interviews, essays, and art work by the artist. "I want to create new fusions with Filipino food that take it beyond its origins while questioning what it is exactly that defines Filipino, or for that matter, any culture’s cuisine as it crosses boundaries. What is lost? What remains? My vision is to connect Filipinos, Filipino Americans, and people around the world through a culinary experience by offering new insights, new spices and shifts to familiar (or unfamiliar) dishes and show the breadth of what Filipino cuisine is and could be." After spending a year documenting Chicago artists making amazing work, Inside the Artist’s Kitchen has decided to go a step further by developing a program that supports Chicago artists directly. We are pleased to announce our Digital Residency program, which will foster creation of new work in the Chicago community. Our 2014 featured artist is Kiam Marcelo Junio, who will be presenting a new web series called Filipino Fusions. 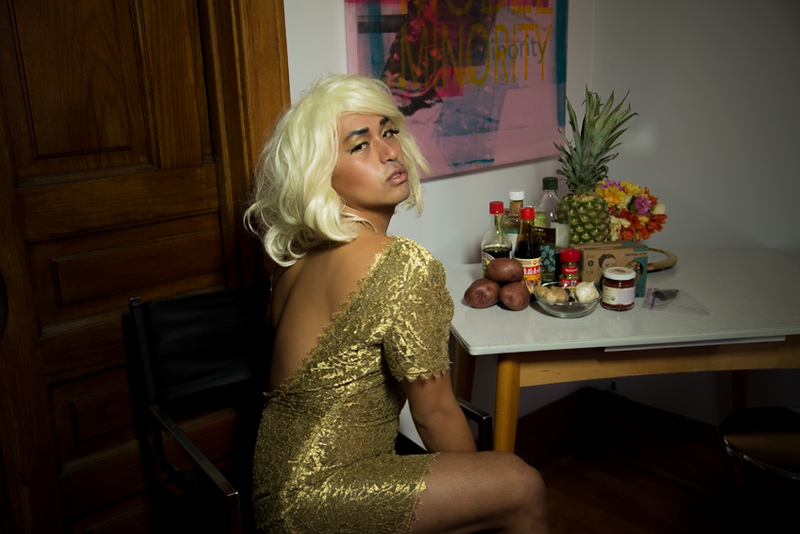 Over the course of the year, Junio will explore Filipino American identity and cuisine as influenced by trade, colonization, cross-cultural exchange, and the diaspora through the lens of their performance alter ego Jerry Blossom. Each month, Jerry Blossom will present a new vegetarian recipe rooted in Filipino cuisine. Filipino Fusions is generously sponsored by Surmount Studios, Upton’s Naturals, and Cody Copeland. Get the "Kare Kare" Recipe HERE.